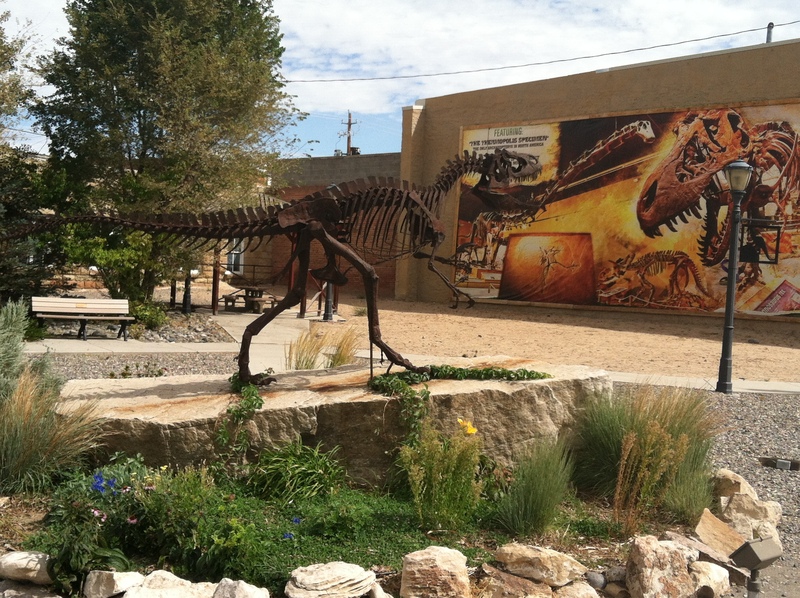 As we climbed into our car our intention was to head directly for Wyoming’s Dinosaur Museum located about 45 minutes North in the town of Thermopolis. To our delight after about 3 minutes down the road we entered one of the largest naturally occurring natural history museums in the world. 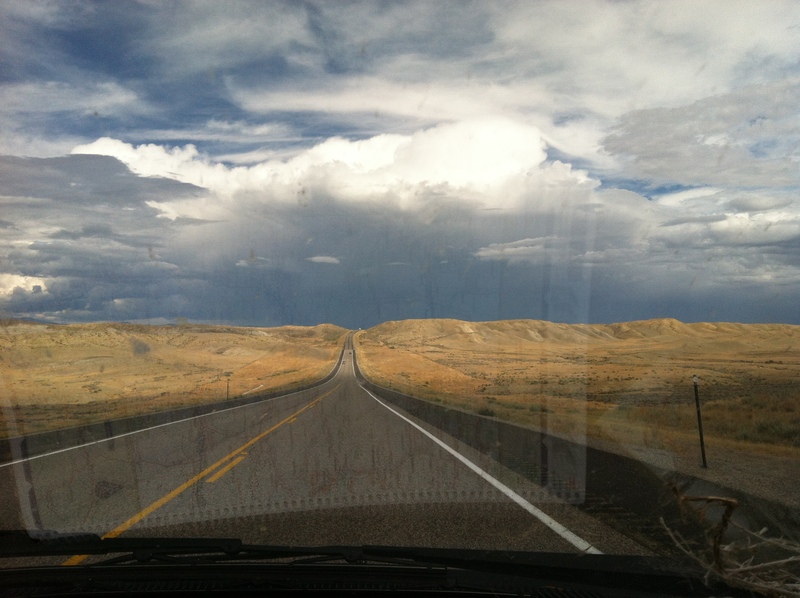 The road clung to the side of the steeply carved Wind River Canyon. Here, the Wind River carved through a concise story book that displays almost the entire history of life on earth in impeccable chronological order. The journey began with some of the oldest exposed rock on earth. Cambrian shale and limestone were at the start and held countless fossils of life forms from 450 million years ago. As we sped down the road winding through tunnels and hugging tightly next to cliff and roaring river we passed signs marking the type and the age of the rock. One after the other, a sign highlighted different notable formations for example “Such and such formation, Permian, 290 myo (million years old).” At the time the numbers were so big that it didn’t mean anything. As we drove on peering 2,000 feet up crumbly walls to the sky it began to sink in that this was no ordinary canyon. It turns out the Bighorn Basin is notable for being one of the most complete hotspots in the world for preserving the story of prehistoric life on earth. After about 25 minutes we exited the canyon and arrived into Thermopolis, its name inspired by the hot spring state park located in the city limits. That day held temperatures in the 90s therefore our interests were not on the hot springs. With an unquenchable curiosity sparked by the run through Wind River Canyon we headed to the Wyoming Dinosaur Center. It turns out that this region was host to a succession of prehistoric swamps, coastal regions, oceans and seas mostly teaming with life for hundreds of millions of years. Over time each era became compressed and preserved: Limestone and Dolomite which make up a large portion of the rocks is essentially compressed sea and coastal life. Sandstone, also abundant, was created during this prehistoric era. Dinosaurs didn’t really show up until about 240 million years ago. They were on the scene at first as the recovery species directly after THE largest mass extinction of life that the world had ever seen, and then taking center stage as the world’s dominant life form about 180 million years ago. During this epic tale, the landscape continued to gather and stockpile the clues of life on earth due to its variation of mostly shallow sea and coastal life. At about 80 million years ago the landscape started to change in a way that this region had never experienced. Due to the slow and shallow subduction of an ancient Pacific plate under a North American plate, the middle of North America began pushing upward. Lasting only about 20 million years it was during this era of land contortion that the dinosaurs died off almost completely, a time most commonly referred to as the Laramide Oraginy. For this region it means that the perfectly chronologically stacked sea life rose into one of the Highest regions of North America also known as the Rocky Mountains. It has been the popular opinion for quite some time that the Dinosaurs were rendered extinct via a large meteor from outer space. However evidence keeps pointing towards another earthly inspired mass extinction caused by an overwhelming amount of Volcanic activity rendering the air poisonous. During the Dinosaurs final golden years over 60 million years ago we saw some of the most famous dinosaurs such as the Triceratops and Tyrannosaurus Rex reign supreme over the land only to die off in some of the largest mass dinosaur graves ever found here in the Bighorn basin. From here on, as prehistory turned to history this region would take on a few more major changes, including major cooling causing several successions of glaciers to carve at varying depths into the landscape then finally becoming windswept and arid, leading to and eventually arriving at present day with a climate and landscape of preservation. Currently, this region has a very low human population leaving most of the land under federal management. It remains very dry due to its ideal location, just out of reach of almost all major weather patterns that crisscross the country. It’s actually so easy to find fossils here that one of the attractions offered to visiting tourists is the option to go on an archeological dig and find your very own fossil souvenirs. Unfortunately we were here on a National holiday so we didn’t get to do this…”next time”, I had to explain to a very disappointed Elias. From here we were to head only an hour or so north and east into the Big Horn Mountains and the climber’s jungle gym at Ten Sleeps!